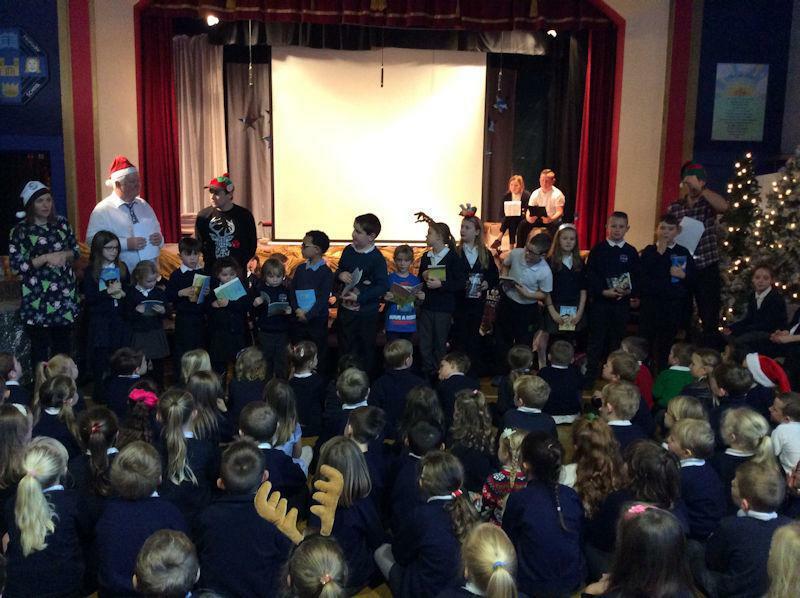 On 14th December 2016, children from across the school took part in our annual Christmas Poetry Festival. The event was overseen by our esteemed judges, "The Three Chrisses!" - Chris Howe, councillor Chris Emmas-Williams and author Chris White. Chris White is a local published author of books such as 'Don't Put Dave in the Microwave' and 'Never Give a Duck a Pen'. He is also a great cartoonist, and he illustrates his own books. Previously, all of our children had learned some poems which we provided for them - and many children wrote their own. Auditions were held in front of classes and then three boys and three girls were selected from each year group to perform in front of the judges and school. Mrs Goodburn introduces the proceedings. Y6 children introduce each of the performers. Judges - The Three Chrisses - with Mrs Goodburn. Chris White performs some of his poems. Our children all join in! From each year-group, two winners were picked by the judges, and prizes were awarded. The winners performed their poems again for their chance to win the Poetry Festival! Three children were selected by the judges as the final winners. Our winners performing their poems. Our judges congratulated everyone who took part, and said how much they had enjoyed the event. We want to say a great big WELL DONE to all of our children, who learned and performed their poems so well at each stage of the competition. We'd also like to thank our judges, and extra thanks to Chris White who also ran some poetry and cartoon workshops after the Poetry Festival.